Product manufacturing is in a state of constant change and we know our customers are continually faced with design and speed-to-market challenges, in addition to competitive pressures that demand business, production and cost efficiencies. At PCI, we challenge ourselves every day to be a leader in innovation and technology across all areas of our business from plastic part design for manufacturability support, material selection, production, and much more. Our goal is to equip you with the competitive leverage that gives your products a superior advantage. Our experienced engineers and service personnel are committed to being valued partners that identify design, development, production and cost efficiencies to provide the highest level of service and value for our customers prior to cutting any steel. PCI has invested over $1.2 million with RJG eDart® to boost our molding and operational capabilities. We have the capability to utilize RJG eDart process control systems on all of our injection molding presses. This system has enabled us to reduce scrap rates and processing time, while allowing us to actively monitor job performance and process variation. Our experienced technicians are able to capture historical data on every shot in the process and improve overall quality and efficiency. By applying RJG’s in-mold sensors and eDart systems, we can monitor cavity pressure and temperature to help identify variations or weight imbalances as each part is being manufactured. 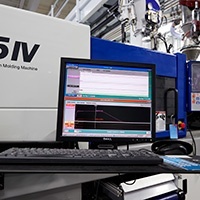 Every step in injection molding builds upon the next and communication is key to addressing all points along the way in regard to timeline and budget. PCI uses IQMS® application software to ensure a seamless manufacturing process from order receipt to product delivery. IQMS provides an efficient way to monitor every machine in real time across both facilities ensuring on-time delivery. 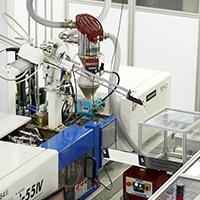 With precision guidance, the ability to carry out specific repetitive actions without variations and adapting to different part types via intelligence-based features, automation and robotics are key drivers in today’s modern plastic injection molding industry. Both facilities operate molding presses with tonnage ranging from 35 to 500 ton. 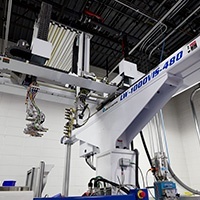 Our ability to leverage robotics systems and automation, led by a team of highly skilled engineers and technicians, allows us to achieve dramatically specific results for our customers. It’s one of many reasons why PCI is a low-cost, world-class producer of small and medium sized, medium and high volume plastic injection molded parts. What is scientific molding? Learn more about out our data and technology-driven processes.